There is a small but growing trend at colleges and universities to ban the sale of bottled water. Water stations with an additional spigot to make it easy to refill usable bottles are also being installed in office buildings, parks, and airports. Over 800 restaurants have agreed to give people with reusable bottles free refills. The non-profit TapIt, has worked with city governments to get restaurants in 22 states to adopt this policy. Some colleges have recognized access to water as a basic human right – as it is – and have installed drinking fountains that have an additional spigot making easy to fill reusable bottles. There are different reasons to stop using plastic water bottles. One is the enormous amount of waste that results, including huge piles of plastic bottles in dumps. Another source of waste is the fuel used in moving new filled bottles all over. We applaud this new direction! We also need to note that there are many good reasons to not just use tap water, but to filter it. For some examples see this report which summarizes a report that showed 315 different contaminants in our drinking water. Many of these are not tested for or controlled by our water suppliers. Very good filtering water bottles are available at our store! 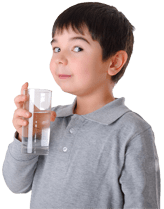 You can have free tap water and then remove heavy metals, fluoride, chlorine and other contaminants.